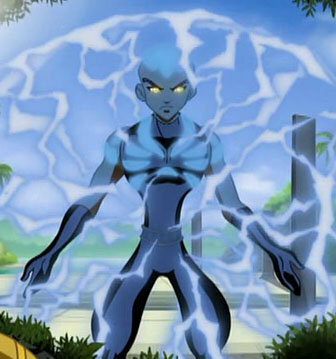 Powers: Azari is exceptionally agile and can channel electricity through his body and even shape it into different forms. Azzari is the son of Storm the weather powered X-man and T’challa the Black Panther. This Prince grew up in a dystopian future where he never knew the love of either parent. He appears to somehow have the skills and abilities of his father (maybe he got to the heart shaped herb?) and a limited form of his mothers weather manipulation which he uses to control and channel electricity. He made his debut in “Next Avengers heroes of tomorrow (which we highly recommend) and has found his way into comics in the newly relaunched Avengers title written by Bendis. kid’s going to make his mom & dad,proud.